Azadbeh, M., Peyghambardoust, N., Mohammadpour, V., Kalantari, A. (2010). Investigation of influences of alloying elements and sintering temperature on the properties of high strength low alloyed sintered steel. International Journal of Iron & Steel Society of Iran, 7(2), 1-5. M. Azadbeh; N. Peyghambardoust; VM. Mohammadpour; A. Kalantari. "Investigation of influences of alloying elements and sintering temperature on the properties of high strength low alloyed sintered steel". 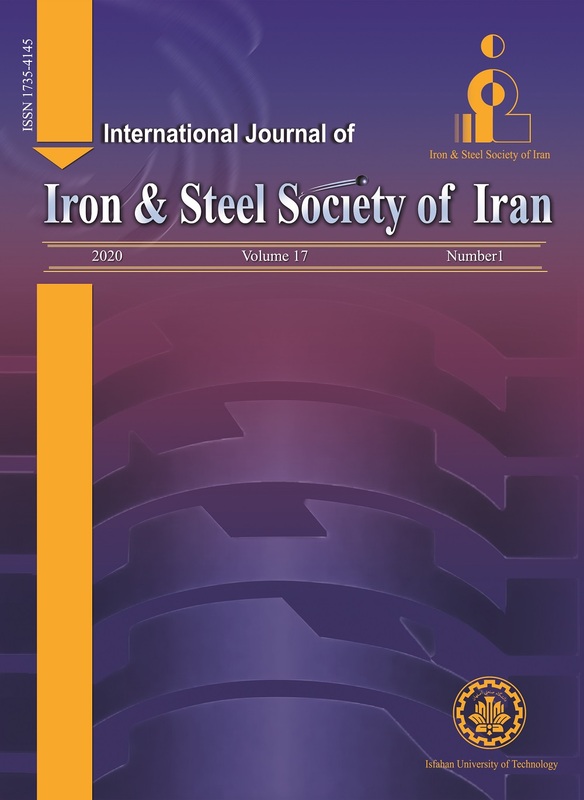 International Journal of Iron & Steel Society of Iran, 7, 2, 2010, 1-5. Azadbeh, M., Peyghambardoust, N., Mohammadpour, V., Kalantari, A. (2010). 'Investigation of influences of alloying elements and sintering temperature on the properties of high strength low alloyed sintered steel', International Journal of Iron & Steel Society of Iran, 7(2), pp. 1-5. Azadbeh, M., Peyghambardoust, N., Mohammadpour, V., Kalantari, A. Investigation of influences of alloying elements and sintering temperature on the properties of high strength low alloyed sintered steel. International Journal of Iron & Steel Society of Iran, 2010; 7(2): 1-5. Producing parts with high density and improved mechanical properties is one of the most important aims of powder metallurgy process. There are many factors for attaining modified properties in sintered parts but among them controlling type and quantity of alloying elements and manufacturing parameters such as compacting pressure, sintering temperature are the most effective. In this research, two series of Cr-Mo prealloyed powders with 1.5% and 3% chromium contents were used, and then influences of manufacturing parameters on physical and mechanical properties were investigated. The results show that by compacting pressure and sintering temperature increment and chromium content decrement, density is increased and subsequently physical and mechanical properties of low alloyed sintered steels are improved. A. Simchi, H. Danninger and C. Gierl: Powder Metall, 44(2001) and 148. U. Engström, D. Milligan and A. Klekovkin: Metall Powder Report, 61(2006), 36. S. Berg and B. Maroli: PM2TEC, MPIF, Orlando, USA, (2002), 17. S. Kremel, H. Danninger and Y. Yu: Powder Metall Progress, 2(2002), 211. U. Engström and R. Frykholm: Metal Powder Report, 62(2007), 18. B. Hu, A. Klekovkin, D. Milligan, S. Berg, B. Maroli and U.Engström: North American Höganäs, USA & Höganäs AB, Sweden, MPIF, (2002). H. Danninger and C. Xu: Proc. EuroPM, Valencia, EPMA Shrewsbury, 1(2003), 269. M. Azadbeh, H. Danninger and C. Gierl: Int. Conf. on Powder Metallurgy and Particulate Materials (PowderMet 2009), Las Vegas, USA, (Select Manuscript, PM Industries NewsLine, 7(2010). P. Luukkonen, E. Hjorstsberg and T. Ericsson: Powder Metall., 46(2003), 335. M. Azadbeh, H. Danninger and C. Gierl: Powder Metall. Progress, 7(2007), 128. S. Kremel, C. Raab and H. Danninger: Proc. of the Euro PM, Nice, EPMA Shrewsbury, 1(2001), 40. M. Azadbeh, H. Danninger and C. Gierl: Int. Conf. on Powder Metallurgy & Particulate Materials (PowderMet 2009), Las Vegas, USA. (Select Manuscript, PM Industries NewsLine, 7(2010). M. Azadbeh, H. Danninger and C. Gierl: Powder Metall. Progress, 8(2008), 83. H. Danninger, C. Gierl, S. Kremel, G. Leitner, K. Jaenicke-Rößler and Y. Yu: Powder Metall. Progress, 2(2002), 125.